HeavenSpirit Creations : the last 3- challenge complete, and big news for me! the last 3- challenge complete, and big news for me! what an inspiring challenge this turned out to be! I'm thrilled that I completed it and thrilled that I saw my skills improve thru the month. here are the last three 3"x3" mini elephant paintings I did of the series of 22. 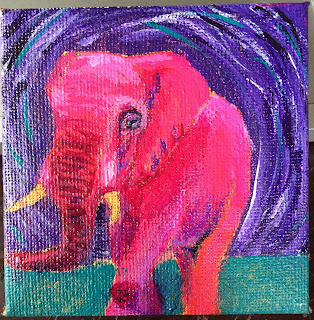 I chose to leave his tusks the underpainting color for 2 reasons. firstly, they didn't need to be white to stand out with this color scheme. more importantly it made a statement to me, my act of not painting them in, about the elephant being killed for their tusks. #21 "Calling in the Dawn"
I started out with baby looking like a mushroom! I will be scanning the paintings to show true colors and then posting them all here in order for you to see them in their best light. there has been a lot of interest in buying the originals of these, so I will also be putting them up on facebook, in batches of 5 so as to not blow up anyones feed. before they go to their new homes they will be varnished and the sides painted black to finish them for display. sweetie will be adding these three to my shop this weekend, unless we get to it sooner, in which case I will be blogging the news. 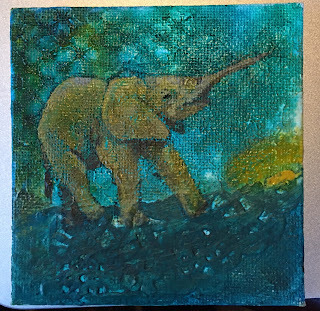 you can find all my elephants in my shop by clicking on the collections button, or message me to buy an original 3"x3" mini elephant painting from me, they will be $15 each (including the easel) plus shipping, and tax if in Massachusetts. and, huge news for me. even though nothing has changed, it feels like everything has changed. 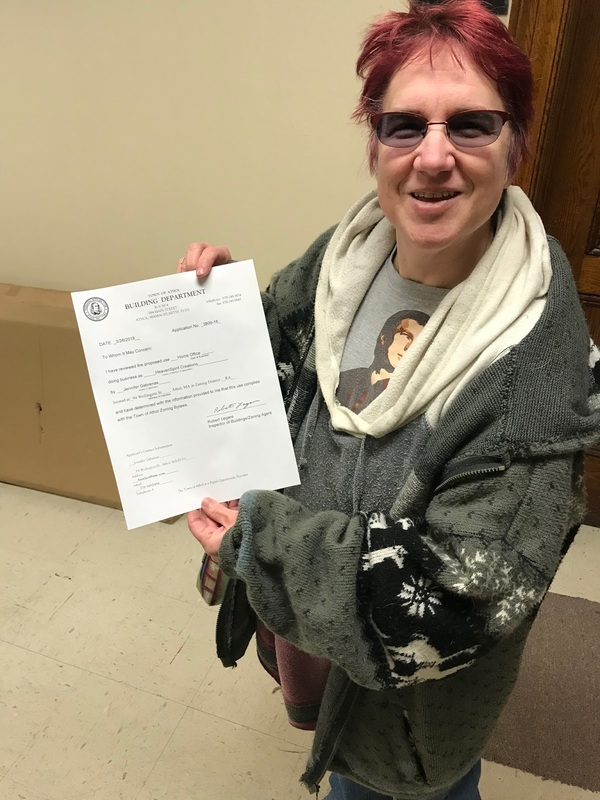 I'm officially a small business owner! yes, I took the big step now that I've decided to go forward with selling and doing art fairs and the like. sweetie and i went to the town clerks office Monday to do their maze of " just go to the office down the hall to fill out a form, then go to the treasurer to make sure you've paid all your taxes and bills, then choose door number three, follow the yellow brick road, then come back and pay us and you are done". (it wasn't too terrible, all in one building, but we got our steps in!). afterwards I opened my business account at the bank so I can pay for my art supplies with my own money, and we went to the store and I bought some workable fixative with my new card! exciting first purchase. to celebrate, sweetie took me out for a bite at a local diner. he had taken the day off to help me with these tasks, and I had a day owed me because he was away on Saturday, doing his 'geek thing', so the timing worked out well. Congratulations! I am so proud of you!!!!! Good luck!